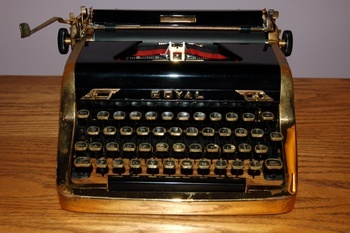 Rare Royal 1953 Quiet Deluxe Gold Portable Typewriter Limited Edition - Ian Fleming wrote 007 novels on one! 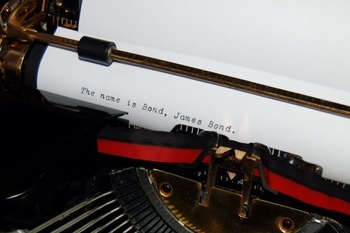 In Movies > James Bond > Show & Tell and Office > Typewriters > Show & Tell. This is my 1953 Royal Quiet Deluxe Gold portable typewriter that was a limited edition model (serial number AG 2533965) Some of these golden models were given as awards to Royal Typewriter company employees. Others were given to high school students who were winners of writing competitions sponsored by Royal Typewriter. The body of this model and many of the mechanical pieces are finished with real gold plating! The gold plated Quiet Deluxe models were reportedly produced to celebrate the companies 50th anniversary (Golden Jubilee) based on a published typewriter collecting book. 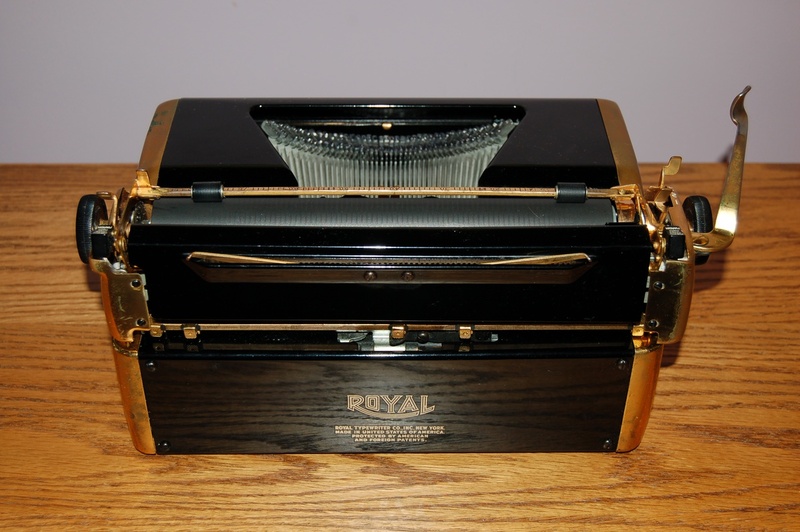 Although I have seen the caption in a typewriter collectors book about the 50th anniversary model, I have never seen any Royal Typewriter company documentation to support this and these gold models were produced for several years. Update: I saw a 1954 Royal Gold typewriter that was for sale on eBay recently that was very similar to mine that had a gold plaque attached on the back that was presented to a top Royal Typewriter sales representative saying “Golden Jubilee Contest. 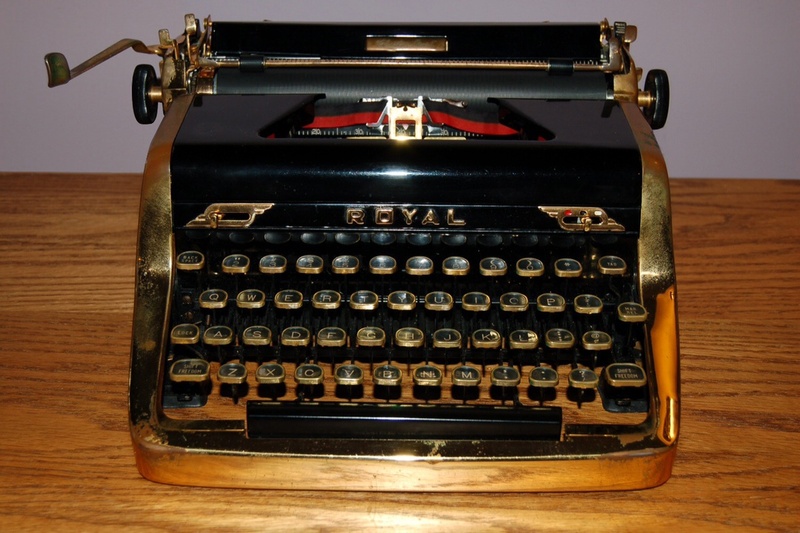 1954 would be 50 years from the founding of Royal Typewriter company. This was my father's typewriter until he passed away almost 30 years ago and you can see his name engraved on it in the photo. He loved to write and use this typewriter, so I have kept it all these years. I can still vividly remember the sounds of my father typing on this and the bell ringing at the end of each line. My father was able to get some of his writing published with this typewriter. This is same identical model as the one that Ian Fleming owned. He wrote the first James Bond novels and used one like it to type many of these novels. There are several different older models of these Royal Quiet Deluxe Gold typewriters, but this is the exact model that Ian Fleming had. If you click on the link in the comment section below, you can see actual photos of Ian Fleming's typewriter, as well as you can buy framed and matted photographs of it in a variety of sizes on that site. There is also a book out called "The Man with the Golden Typewriter" that features a photo of Ian Fleming's typewriter on the book's jacket and discusses how he acquired his gold typewriter. The book is made up of Ian Fleming's letters. Also another book out called Going Once: 250 Years of Culture, Taste, and Collecting at Christie’s that mentions Fleming’s gold typewriter as being one of the most interesting things to be auctioned off in Christie’s 250 year history. There are several links below if you are interested in more details. The one that Ian Fleming owned sold in an auction for more than any other antique typewriter had ever sold for ($89,144.00 US dollars) at the time and there was fierce bidding. The buyer at the auction is rumored to be Pierce Bronson who had played James Bond. I think that Ian Fleming was just really into gold things. He wrote Goldfinger, The Man with the Golden Gun and wrote these in Goldeneye, Jamica (Fleming named the estate Goldeneye) on a gold typewriter. There is even a gold typewriter written into the novel Goldfinger! This particular model seems to be very rare based on conversations with collectors and since I only see about one a year for sale on eBay. When you do see Royal Gold models on eBay, 80% of the time it is not the Ian Fleming model. Just recently one in great condition like Fleming's sold on eBay for $2000.00! This typewriter is in good condition, but the gold plating is worn off on it in many places because my father had used it a extensively. I am not a James Bond collector, but I would like to display this after restoring the gold plating. The black finish and decals are flawless. I also have a "typed" letter on Royal Typewriter letterhead dated 1953 to my father talking about getting this model with italic type. 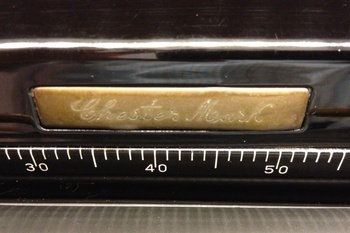 This typewriter does have the Italic type shown above, so Royal Typewriter provided it for him. 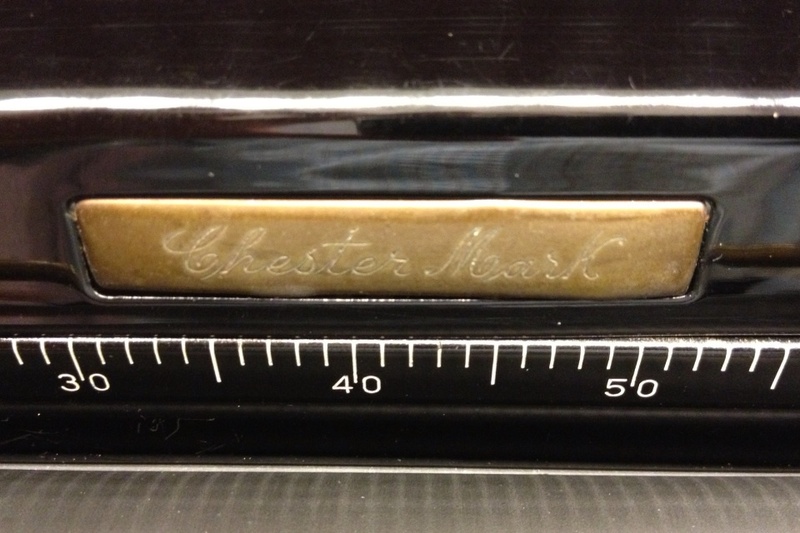 I may have the only 1953 Royal Quiet Deluxe Gold typewriter with this italic type style. What company would type a full page letter today to make a sale of only $174.00. Wouldn't this typewriter look great on my living room table restored with this letter in the typewriter and the Royal Typewriter letterhead showing! Book written about Ian Fleming with the Royal Gold Deluxe typewriter featured on the front cover called "The Man with the Golden Typewriter"
Another book called "Going Once" that features the 250 most interesting things auctioned at Christie's in the last 250 years includes Ian Flemings Royal Gold typewriter.